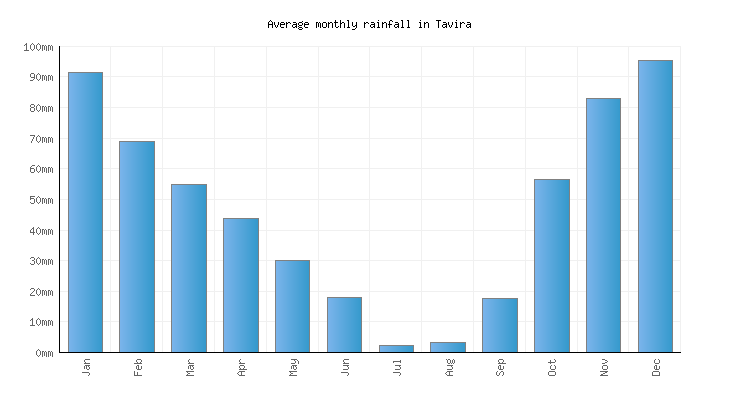 Tavira Climate and When to Go? The town of Tavira enjoys a hot summer Mediterranean climate, sitting along the south coast of the Algarve region of Portugal, facing the Atlantic Ocean and the Gulf of Cadiz. The result is that the town receives plenty of sunshine throughout the year, with mild, fairly wet winters, and hot, dry summers, when many tourists come to enjoy the secluded and relatively unspoilt sandy beaches. Thanks to a large, permanent population, most shops and restaurants in the town remain open all year round. Spring is a good time to visit Tavira, because there is plenty of sunshine, whilst daytime temperatures usually reach the low twenties and there are few tourists around, meaning that visitors can book late and still find good deals with flights and hotels. There might still be the occasional rainy day, but towards the end of spring, in May, temperatures usually begin to heat up making for ideal beach weather, with few if any crowds, although the waters at this time of year are still pretty chilly. Summers are warm and dry, with daytime temperatures averaging at just below 30ᵒC (86ᵒF) thanks to the cooling sea breeze, although it can rise above this during warmer spells. 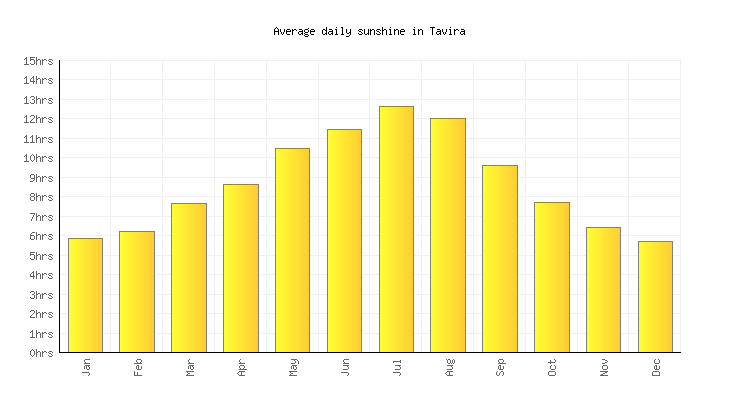 From June until September there is very little rainfall, particularly in July and August, with sunshine and clear blue skies becoming the norm. However, summer can become busy, and visitors might need to book far in advance to find cheap flights and decent hotel rates, but that said, the sandy beaches around Tavira are protected by a national park, which makes them less busy than most other parts of the Algarve. Like spring, autumn can be an excellent time to visit Tavira because the summer heat and crowds have gone, but there is still plenty of sunshine and opportunities to enjoy the wonderful sandy beaches without having to share them. The coastal location ensures that daytime temperatures tend to stay comfortably above 20ᵒC (68ᵒF) well into October and sometimes into November. Whilst September tends to be dry like the summer, later into autumn, visitors might have to put up with the occasional shower and some overcast days. Winter weather can be rather unpredictable in Tavira, with sunshine and temperatures in the high teens or even hitting the twenties allowing for shorts and t-shirts one day, whilst the raincoats and long sweaters might be necessary the next. Still, the southern coast of Portugal receives far more sunshine and warmer weather than most other parts of Europe and can be almost deserted at this time of year, so for those who don’t mind putting up with the occasional wet day, winter can be a good time to explore the area.